COTABATO CITY - May 25 has been declared the Heavenly Culture of World Peace Restoring of Light (HWPL) Day in the province of Mindanao. in the official launch of the Peace Monument, 25 May 2015. The declaration aims for the return of progress through peace in the province, said Maguindanao Governor Esmael Mangudadatu. The declaration was made during the Peace Summit attended by thousands of people from different sectors. 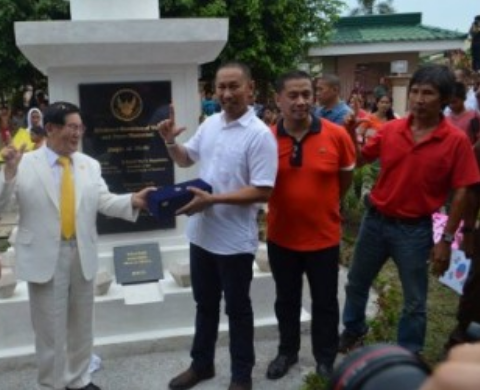 The Peace Monument, in front of the Rajah Silongan Peace Center that is also serves as the office of the governor, was also officially opened to the public. Man Hee Lee, HWPL chairman, and known world peace activist, IWPG chairwoman of an international women’s peace group, joined Cagayan De Oro Bishop Antonio Ledesma, and various peace at Moro Islamic Liberation Front officials in the celebration. Participants also prayed for the passage of the Bangsamoro Basic Law.